What are the best bud trimming scissors ? There are so many out there right now. Many growers have a favorite type of trimmers they use on their cannabis plants. But not all trimming scissors are made the same.We have used dozens over the years and keep coming back to a solid few. You will find everything in this guide for the best bud trimmers on the market. 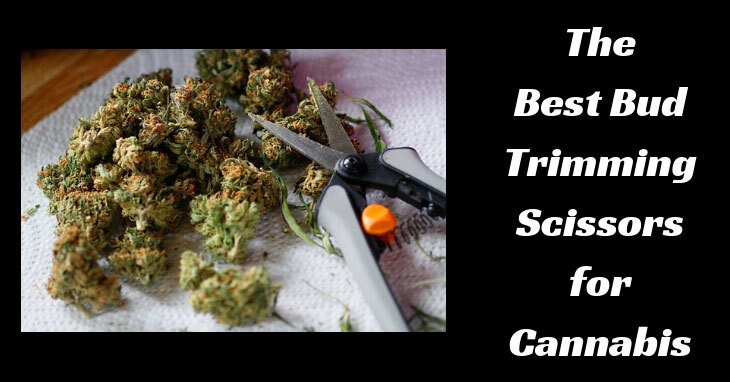 We take a look at the trimmers and scissors that are used every day by growers like yourself and give you solid info on what’s good and not about them. Who like hand cramps? Answer NO one. Also, there is a quick buying guide on what to look for and the different types if you’re new to the scene. If you’ve been trimming awhile, there’s no need to check out the different types. Feel free to skip to the good stuff. Comfort is a significant factor because you’re going to be using the scissors for a period and it should feel good in the hand and not feel restrained. With either finger holes depending on scissors or the handles are too small and are continually jamming the palm of your hand. Blades will come in different sizes and forms some are curved or straight. Some are nonstick or have unique material making them more durable such as titanium. The various sizes for the different jobs they require. Spring-loaded this is an excellent feature when trimming your cannabis because it will cause less cramping in your hand than manual hand trimmers, even some fine bud trimming scissors come with springs. Sometimes the springs are not necessary depending on the type of trim job you are doing. Ease of use is an essential factor this also prevent strain during times of extended trim sessionscleaning. The build-up of resin can be a hazard at times and even slows down performance, all trimmers will gunk up. Just how fast? Some have a coating on the blades that make it easier to clean with an alcohol wipe or cleaning gel. How long they last because some of the trimmers out there are cheaply made and may not make it past your first harvest. So, then you end up buying more in two to three months or the next time you harvest. Trim Tip: If you’re not wearing gloves, clean your hands with coconut oil, olive oil or grape seed oil to clean scissors and too clean hands. There are various types of trimmers for different stages of the trim process. The cutting down of your stalk and branches is done first by most growers. Some cut the whole plant down and hang or some cut the branches and stalk then hang. There are also growers out there that cut the branches and stalks smaller and use a hanging basket for drying their herb. Pruning Shears are used in this case and have stronger and thicker blades. The trimming is done before, and after the branches and stalk have been cut down. 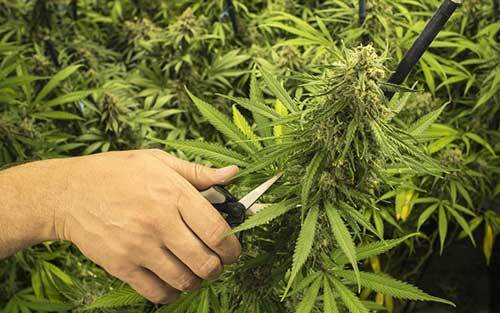 Most growers will want to trim the plants bigger leaves off making it more manageable. Or they will do this after they have been cut down. It is the preference of the grower. Close trimming may be done before the hang. By using finer cannabis trimming scisors. But not taking all the little leaves off around the bud ensure the bud dries properly and not too quickly. Finishing touches like manicuring this can be done when the first dry is complete after 7 -10 days or however long you hang your plants to dry. This is usually the touch up remove the dried leaves to showcase the awesome new bud you grew. Titanium pruning shears are best used for the cutting branches when you’re first starting to do your trim. These titanium pruning shears can slice right through a small branch like butter, coated with titanium to prevent wear and tear. These pruning shears are comfortable on the hands because they have an ergonomic design to them. The Bypass pruning shears are an excellent choice for cutting through branches under an inch in diameter. We recommend something around half an inch or smaller. The bypass pruning shears also come in two different sizes large or small. The Fiskars Anvil pruner has a Leverage technology which enables you to have Twice the Cutting strength as traditional pruning shears. It’s great when you need to cut bigger branches from your cannabis plants. The name Anvil says it all this years are very sturdy and her favorite among marijuana growers. Happy Hydro Curved Tip Trimming Scissors are smooth and easy to use. Resin build up is less with a teflon coating on these trimmer blades. Nice and simple to clean. Curved for doing the most detailed work around buds or hard to reach areas of the plant. Nice on hands even with arthritis. Also has a safety lock to ensure proper storage. Sharp and ready to conquer the harvest. The Vivosun curved blades trimming scissors are good at getting a quick trim done. The spring action is smooth on the hands. These trimmers can make quick work trimming up your plant before drying. Great for the buds and branches not recommended for the stalks. HydroFarm curved blade trimming scissors are Curved to provide a more fluid transition of trimming on the bud. The curved blade pruner will last for hours light trimming your cannabis buds. These trimmers can also be used for small stems and leaves. The Fiskars non-stick micro pruning snips make trimming so smooth and effortless that there are little hand fatigue and cramping. A nice feature is the non-stick coating which can prevent you from jamming and buildup of resin; this also makes it easy to clean. The Microtip Fiskars is a top Choice among Growers. A great all round trimming scissors. The Happy Hydro Straight Tip Trimming Scissors come with a different coating than other trimmers out there. With a teflon coating these trimmers are non stick and also corrosive resistant. The easy spring action of the trimmers is nice, with a comfortable rubber grip can be used with all types of hand strength. It’s nice you don’t have to clean these every few minutes getting caked in resin. Sharp and ready to trim, with 3 inch blades. The Vivosun straight blade pruning shears are easy to use for trimming your cannabis plants. Because the trimmers help by automatically pushing themselves open without you having to do the work. It’s great to prevent hand strain and also if you have any hand related issues. The Hydrofarm Titanium Precision Pruner can be used for hours without ware. These trimmers are sharp and are easy to clean especially if the titanium coating. Hydrofarm precision pruner can be used on the small branches and trim buds, not recommended for stalks. 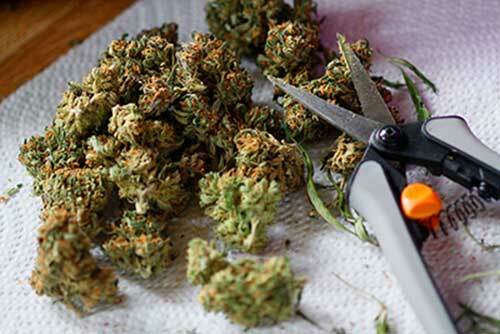 Here are some of the best fine cannabis trimming scissors for the buds of your marijuana harvest. The Chikamasa B-500sf Stainless Steel Scissors are fantastic during the last Trim. Coated with fluorine a resin resistant material specifically designed to have a smooth operation when trimming. The Chikamasa Scissors will last a very long time and are a top choice among Growers. The Happy Hydro 60mm Trimming Scissors are for the final trim of your awesome buds. With a non stick coating of Teflon you can go for a long time before you need to clean your scissors. Easy to use with a ergonomic design, can be used for a long time. Straight blades nice and long can get a detailed finished. The Hydrofarm Bonsai shears are a very comfortable pair of scissor for fine trimming your cannabis buds. Wicked sharp and very light. What’s great about these scissors is that you can use the right or the left hand when using these it’s so handy if you’re left-handed a bonus to these scissors. If you need your scissors cleaned quick check out the Scissor Fix. Originally designed for the aerospace field. It’s now spun off into the cannabis industry. Scissor fix will not dull or rust your blades, cleans in seconds. This can be convenient if you don’t use homemade methods yourself. There’s many ways trim your cannabis plants, we will just go over the basics on how to trim the plant. To trim your plants this can be done in three simple stages. In the first phase of trimming you want to use a pair of trimming shears and you can either a cut the main branch, taking the whole plant. Or cut one of the large main branches off taking with it all of its secondary branches attached to it as well. Next you’ll want to use a pair of trimming scissors and start taking off the bigger fan leaves along the branches and stems. This is all done by preference, some growers just takeoff the bare minimum of the fan leaves and leave most of the leaves on. By doing this it helps the dry process last longer or to help with their current environmental conditions. Be careful not to cut off any of the Little buds attached to the stems. You will want to leave some of the smaller leaves around the bud sites to still be attached as this will aid in the drying process. Now lastly you want to make sure that you take enough of the exterior leaves off the plant. So the branch will dry at an even pace with your other cuttings while you’re hang drying. Finally hang the branch in your grow room or grow tent whichever you’re using to dry your cannabis plants. Next move on to the other main branches or plants of your choice. Everyone trims there cannabis buds differently, some use machines some use trimmers and some you scissors. The section will just go over the basic trimming by hand with trimmers and or scissors. After your plants branches have been drying in your drying room, grow tent or grow room. You will want to trim the buds off the branches now. This is done by doing the following. Take your branch and slowly trim off any little leaves that are still left on the branch. Or if you leave a lot of the fan leaves and little leaves on, start to go to town and trim by taking the big fan leaves off, next the smaller leaves. After that you can go to the leaves around the buds section and slowly depending on how dry it is peeled back the little leaves around the buds and they should just break right off. If this is not the case, you can gently trim around the bud it slowly take off the excess leaves. Be careful not to trim too close to the bud as this will remove a lot of the trichomes from it. Once done clip off and dropping mason jar at your choice or bucket whichever you prefer for the next part of the drying method. Proceed to go down each branch or stem with the buds on them and carefully remove any excess leaves. Then keep repeating until you fill up your jars or buckets with your freshly trimmed cannabis buds. This is just one of the many ways to trim your cannabis buds and a very basic form. When looking for a pair of bud trimming scissors, you want to look for ones with the smooth operation and is easy on the hands. Because trimming takes a long time as you may know. The trimmers listed above are the best ones out there so far. These are the Top 4 trimmers recommended for different types of the trim. The Anvil is what you should use at the start for cutting down the stalks of your cannabis plants. Because of it makes a good solid slice right through the stalk. You may also want to use spring-loaded trimmers one of them the Fiskars Non-stick Micro-Tip Pruning Snip. It’s used throughout the grow taking off fan leaves here and there I also like to do that towards the end as well. Then for your buds or fans leaves, the Hydrofarm Curved Blade Pruner it gets in there around those corners get the curved blades. We love how sharp they are. For the fine trim, nothing beats the Chikamasa scissors model B-500sf. These scissors are used before the buds going to the jars if they need any touch-ups. Now these are razor sharp, and light and have a nice flow to them when using them to trim. What trimmers do you use? What scissors do you use in your final trim. ?